First up is shoes of some sort - I honestly don't know how people can wear heels abroad (even though I feel underdressed in flats), however the way forward is a pair of gladiators, I can wear them during the day and they're dressy enough for nights, and I can wear back home. Apparently the size of bags which you can take on a plane has changed since last time I've been on a plane. Normally I take the biggest bag I can find and then fill it up with items from my suitcase - not this time. 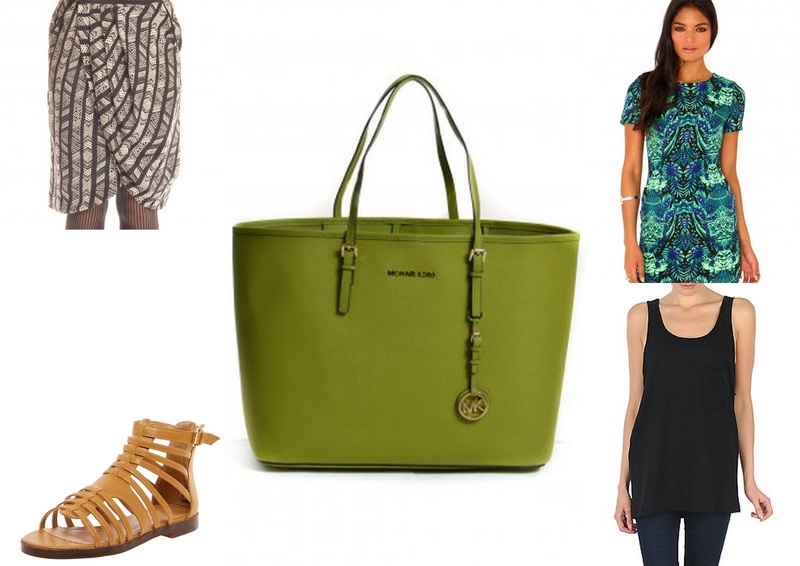 I know everyone loves Michael Kors watches however I am loving this olive green medium travel tote - big enough to fool my brain that its "huge" yet more plane friendly. Following on with the green trend, I was obsessed with Tor's top which she was wearing last Saturday when I saw her as soon as she posts an outfit picture I will link you up, however she said that there's a dress version from Missguided - oh my goodness I need this... not for holiday but for my post holiday night out, you know when you look amazing tanned (always a forward thinker). I really should have put the last two items together in the picture above as it would make the most perfect meal/few drinks outfits and then I know I can get wear out of the both when I'm home. I've found this Daybirger skirt which is the perfect ethnic summery skirt. Last up its another American Apparel basic which I need and this time its their basic unisex big pocket vest, regardless of the fact I have a 1001 black vests - you can never have too many. Also if I need to convince myself any more I can wear it with jeans and a jacket.